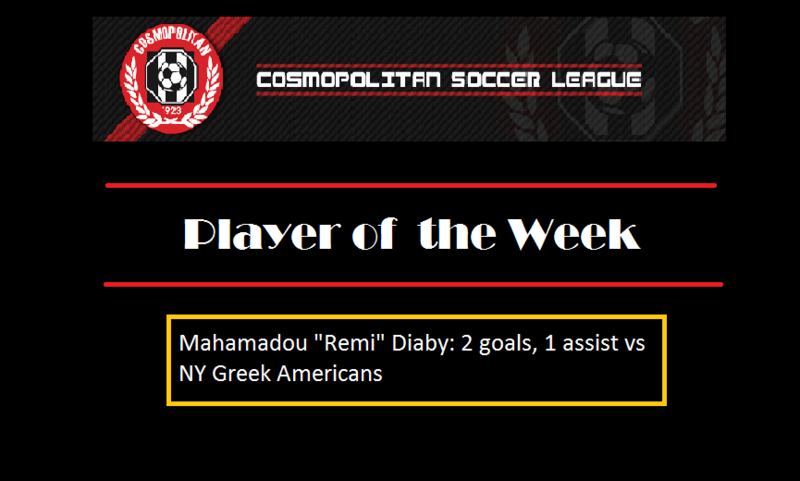 Manhattan Kickers striker Mahamadou “Remi” Diaby was nominated the first division’s fourth player of the week of the season for netting a brace and racking an assist against champions NY Greek Americans in a 3-3 draw. The Kickers were promoted to D1 this season; their fellow promoted team, Central Park Rangers Whites' midfielder, Idy Watt, won the accolade last week for netting a double against NY Athletic Club in a 2-2 draw. Remi jump to third spot in the top scorer chart with three goals. For his first goal, the 26-year-old tipped the ball over NY Greeks keeper before shooting it in the net from five yards in the 20th minute. And his assist was an exquisite back heel flick to Brian Morris, who faked two NYGA defenders after receiving Remi’s pass then tucked the ball in the right corner of the net. Remi completed his brace in the 77th minute as he controlled a long ball before speeding past two NY Greeks players to beat the opposing keeper in a one-on-one situation. The promoted team played the game without any subs. Two of their players played the whole 90-plus minute with injuries picked up in the middle of the match. In their first season back in the top flight, Bryan Baracaldo’s men sit in sixth place after four games with a 1-1-2 record. They’re the topscoring team with nine goals. And after playing the champions, Manhattan will go against the top three teams from last season: NY Shamrocks SC, Lansdowne Bhoys and NY Pancyprian Freedoms.